For related uses of "pontoon", see float (nautical). For all other uses, see pontoon. A pontoon boat is a flattish boat that relies on pontoons to float. These pontoons (also called tubes) contain a lot of reserve buoyancy and allow designers to create massive deck plans fitted with all sorts of accommodations, such as expansive lounge areas, stand-up bars, and sun pads. Better tube design has also allowed builders to put ever-increasing amounts of horsepower on the stern. Pontoon boat drafts may be as shallow as eight inches, which reduces risk of running aground and underwater damage. The pontoon effect is when a large force applied to the side capsizes a pontoon boat without much warning, particularly a top-heavy boat. Common boat designs are a catamaran with two hulls, or a trimaran with three hulls. Boats with three hulls are sometimes called tri-toons. Small inflatable pontoon boats are one or two person, catamaran type boats, designed for leisure and fishing. Their pontoons are made out of abrasion resistant PVC and nylon with aluminum, steel and/or plastic frames for support. In today’s setting, more and more people prefer to use frameless pontoon boats. They are powered with paddles, oars and often with electric trolling motors using deep cycle lead batteries. Commonly they are equipped with motor mount, battery storage area, fishing rod holders, canopy, fishfinder mount, small anchor and other required fishing gear. Such boats are suitable for ponds, lakes, rivers and seas during calm weather. However, due to light weight, they are susceptible to waves and windy conditions. Nonetheless, such boats are often used even for big game fishing. Pontoon boats for pleasure boating and fishing can be low cost for their capacity, and cheaper to insure than other boats, even when equipped with substantial engines. Pontoon boats are used as small vehicle ferries to cross rivers and lakes in many parts of the world, especially in Africa. 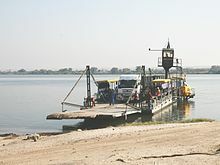 Pontoon ferries may be motorised, such as the Kazungula Ferry across the Zambezi River, or powered by another boat, or pulled by cables. A type of ferry known as the cable ferry ("punts" was what they were called in the medieval times and in modern Australia and New Zealand) pull themselves across a river using a motor or human power applied to the cable, which also guides the pontoon. Pontoons may support a platform, creating a raft. A raft supporting a house-like structure is a houseboat. The flotation tubes of rigid-hulled inflatable boats are often referred to as pontoons. The 1939 invention of the pontoon motorboat in the United States is credited to a farmer who lived on the Horseshoe chain of lakes, near Richmond, Minnesota. Ambrose Weeres put a wooden platform on two columns of steel barrels welded together end-to-end, creating a sturdy deck that would be more stable on a lake than a conventional boat. Living in the "Land of 10,000 Lakes", Weeres thought this idea might be marketed. The first boat was "The Empress". He built a few boats and sold them with the help of dealers. He started Weeres Industries to meet unexpected demand. Weeres, later called "Mr. Pontoon", was elected to the Minnesota Marina Hall of Fame. Wikimedia Commons has media related to Pontoon boats.